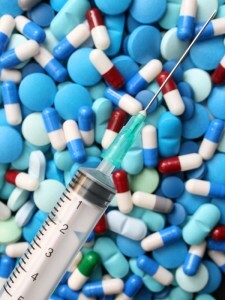 Drugging is a leading cause of elder abuse in California nursing homes. Each day, about 25,000 California nursing home residents – almost one of every four residents – are given antipsychotic drugs that greatly increase their risk of death. If you have dementia, the odds of being drugged are much worse. At least half of California nursing home residents with dementia are given antipsychotic drugs despite FDA “black box” warnings that these drugs cause elders with dementia to die. 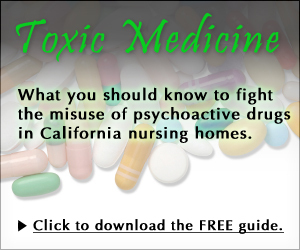 Why are antipsychotic drugs so widely used in California nursing homes? In many cases, nursing homes use them to sedate and control residents and as a substitute for needed care. Drug companies heavily promote misuse of these drugs through illegal marketing campaigns directed at doctors and nursing homes. Absentee doctors often rubber stamp drug orders requested by nursing home staff. Resident or family consent is rarely sought and almost never truly informed. State licensing officials are part of the problem due to poor enforcement of laws against drugging. CANHR is dedicated and determined to stop the epidemic misuse of these drugs in California nursing homes but we need your help. Sign our petition and join our campaign. Read our guide, Toxic Medicine, to learn how to protect yourself or a loved one from inappropriate drugging. Share your experiences or recommendations through our blog. Use this site to get better informed about the dangers of drugging and spread the word. Call us at 1-800-474-1116 if you need advice about someone who has been harmed by antipsychotic drugs or any other form of psychoactive drugs. The time is now to end the inappropriate drugging of California’s nursing home residents.